Domain of One’s Own (DoOO) is a project held close to the hearts of many of us in the Virtually Connecting community. This year marks the first conference dedicated to DoOO: “Domains 2017, Indie EdTech and Other Curiosities“. 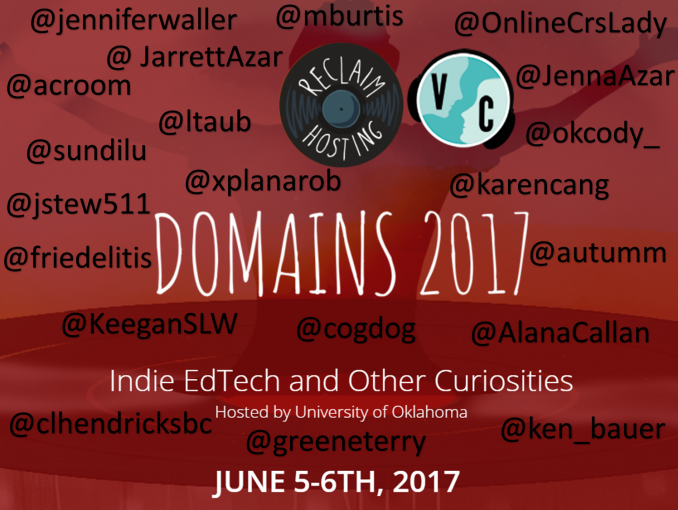 We are excited to offer four opportunities to connect virtually to the event and converse with the people at Domains 2017, Indie EdTech and Other Curiosities which is being held at the 21c Museum Hotel in Oklahoma City, OK, USA on June 5 and 6, 2017. We have onsite buddies Sundi Richard, John Stewart, Karen Cangialosi, Alan Levine and Keegan Long-Wheeler connecting you through our virtual buddies Terry Greene, Alana Callan, Christina Hendricks, Christian Friedrich, Autumm Caines, and Ken Bauer. Virtually Connecting sessions allow virtual participants to engage in conversations with onsite participants – it’s all informal, more like a conference hallway chat. Our first session will actually involve on onsite roaming buddy for the Domains Fair, it should be great! If you’re interested in joining any of these sessions, please sign up using this form or you can tweet us @vconnecting or leave a comment below. We’ll ask for your email address so we can send you a link to the session just before it goes live. Title times are local of the conference site, scroll below to find the times adjusted to your time zones and the links to watch the sessions live or recorded if you can’t make it into the session itself. Our brave onsite buddies Sundi Richard and John Stewart will be traversing the Domains Fair to give voice to our virtually connecting participants during this event. Terry Green and Alana Callan will be our virtual buddies for this event. We connect with Lora Taub, Jenna Azar and student Jarrett Azar for a conversation led by our onsite buddy Karen Cangialosi and hosted by our virtual buddies Ken Bauer and Christina Hendricks. We invite you to connect with the conference keynote speaker Martha Burtis. Alan Levine and John Stewart are our onsite buddies for this session and the virtual buddies are Christian Friedrich and Autumm Caines. and Jim Luke asked to join as well – this is proving to be a great session. Jessie will slot in as goalie and Jim in right field. The positions are an inside joke, don’t worry if this makes no sense at all. Alan Levine will be our onsite buddy joined by Ken Bauer as virtual buddy for this session. A full room with Laura Gibbs, Adam Croom, Jen Waller, Cody Taylor, Rob Reynolds, John Stewart and students from OU. Not all are confirmed but we should have a good selection from those to give us the wrap-up thoughts of the event. Onsite buddy is Keegan Long-Wheeler with virtual buddies Ken Bauer and Christian Friedrich. If you’re interested in joining any of these sessions, please sign up using this form.